Andrew Gillum might be the governor of Florida right now if the state had allowed people with felony convictions to vote. It’s fitting, then, that his first postelection project will be to register new voters across the state. Politico reported on Wednesday that Gillum has launched a new organization, Bring It Home Florida, to register new voters; at the same time, the state Democratic Party has announced that it will invest $2 million to register 200,000 voters. As Politico notes, registered Democrats currently outnumber Republicans in Florida, but there are 3.6 million voters with no party registration at all. If the party could bring even a fraction of those voters into the fold, they’d be a formidable force at the polls. The passage of Amendment 4, which extended voting rights to most people with felony convictions, in November should also significantly expand the available pool of voters. 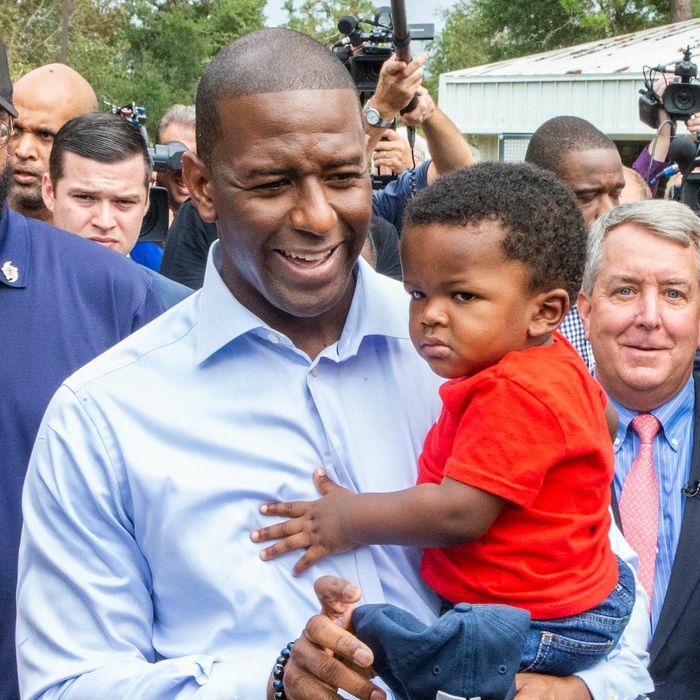 Gillum’s project highlights a major midterm theme. Promising black Democrats — like Stacey Abrams of Georgia and Gillum himself — narrowly lost elections to white Republican candidates against a backdrop of voter suppression. The product of an old and endlessly adaptive white-supremacist impulse, voter suppression did not end with Election Night. Gillum and his party will have to work against state Republicans, who steadfastly seek new ways to keep likely Democrats away from the ballot box ahead of a pivotal presidential election. Republican intransigence doesn’t just create obstacles for Gillum and other Democrats; it also lends fierce urgency to their work. Right now, Florida Republicans appear to be focusing their efforts on scaling back Amendment 4. Though the measure is self-implementing, and thus didn’t require any specific action from state government, newly elected Governor Ron DeSantis has repeatedly insisted that the measure created a significant logistical problem for the state. After first threatening to delay enfranchisement, allegedly so they could determine how to implement the amendment, House Republicans advanced a bill on March 19 that would require this mostly black population to pay all court fees associated with their case before they can vote, even if a judge didn’t sentence them to do so. According to the Miami Herald, the bill “goes beyond” what Amendment 4 actually stipulated, and critics have diagnosed it as resembling the poll taxes that once barred black voters from exercising the franchise. People with felony convictions are disproportionately likely to be low-income, the direct result of employment discrimination and restrictions on the sorts of welfare that they’re eligible to receive. There probably aren’t many who could afford to pay court fees. This new Republican bill wouldn’t just limit the ability to vote to people who could afford to purchase it from the state; it would handily keep the vote away from many, if not most, of Amendment 4’s intended beneficiaries. It is a familiar gesture — the first American gesture, as far as the franchise goes — to restrict the vote to white men of means. Though Gillum’s project doesn’t focus specifically on Amendment 4, it’s a necessary, even subversive effort to expand the vote in the face of a centuries-old campaign to lock it away.